For sometime now, I have been searching for a way to easily access my Google Plus account from my Blackberry smartphone. All the ‘apps’ I ended up with were mere bookmarks pointing to the browser which would then lead you to the actual Google plus website, ha, like I was too lazy to type in plus.google.com on my browser’s address bar. Well, the good news is that I found a real blackberry app that lets you access your Google plus account, it’s called App For Google+. It’s free and available on the Blackberry app world repo. 5. Add, edit and remove circles and people. 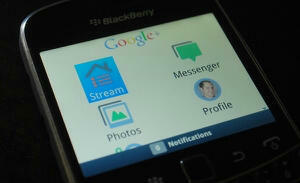 App for Google+ supports blackberry devices running OS 5 and above. Note that this app does not include the Google+ Messenger. Have you used this app, did you like it?